In a lab on N.C. State University’s Centennial Campus, engineers are probing the potential of the Chevrolet Volt’s T-shaped battery once it no longer powers General Motor’s plug-in hybrid electric car. The research is based on an agreement GM and the ABB Group signed three months before the first Chevy Volt rolled off the lot, which was in December. The carmaker and the Swiss-based engineering firm are considering options that range from energy storage to powering bicycles. A Chevy Volt battery is hooked up to an ABB inverter in the ABB lab on Centennial Campus. ABB provides power and automation technologies to utilities and industrial customers worldwide. The firm concentrates on renewable energy and supplies wind and solar energy generators with electrical equipment and services. Its North American headquarters is in Cary and the R&D projects with the Chevy Volt batteries are conducted in the ABB lab on Centennial Campus. ABB employs about 500 in the Research Triangle area and 1,500 in North Carolina. 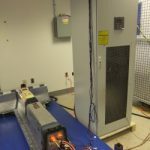 A first step in the research is combining a Chevy Volt battery with a commercially available ABB inverter, a device that exchanges direct current from the battery into alternating current used to transmit electricity on the grid. The next step is hooking up several of the batteries to the inverter, said Sandeep Bala, an R&D engineer in the ABB lab. The learning curve will be steep, Pablo Valencia, the senior manager GM has assigned to the project, agreed. It’s not even known when it’s worth reconfiguring the battery, Valencia said. The T-shaped lithium-ion battery consists of several cells and is built into the bottom of the Chevy Volt’s passenger cabin, with the cross bar being located under the back seat. The battery can power the car for about 40 miles in the city and has to be recharged. That’s the plug-in electric portion of the car. The Volt also has a gasoline tank to go another 300 miles. That’s the hybrid portion of the car. The two power sources make the Chevy Volt the most fuel-efficient car on the market with a fuel economy of 90 miles per gallon to 95 mpg on the highway, according to the Edmunds.com review. Battery cell above rear tire powers an e-bike. How long it takes before a battery becomes available for reuse only time will tell. GM’s warranty on the battery is for eight years or 100,000 miles and after 10 years, the Volt’s battery retains about 70 percent of its capacity. But GM and ABB intend to figure out where else the batteries can be used once they come out of the cars. 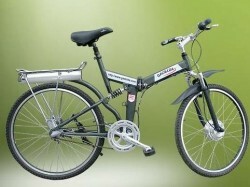 One idea is to break down the battery and use single cells to power electric motors on bicycles. Another is to use the batteries as storage – for renewable energy or as backup for electric outages. Renewable energy is dependent on the sun and the wind, which follow their own schedule. But stored in batteries, renewable energy would be available to flatten peaks and valleys in power consumption and allow utilities to run their power plants more evenly, and therefore more efficiently. “The utilities love that,” Valencia said. Power customers might like a backup system during power outages. The engineers estimated that 33 Chevy Volt batteries have enough storage capacity to power up to 50 homes for about four hours during a power outage. Learn about more interesting facts and articles about science and technology on scienceinthetriangle. Check out our articles on the different kinds of laboratory equipment crucial to any scientific discovery.